In my last post I said the heavens would have to open and emit the mighty sound of OM before I’d have a chance to post some pictures. Well, it finally happened, although I had to leave the monastery to do it. Yesterday was a day off for us so another volunteer (Aksana) and I went to Bhaktapur for the day to check out the medieval Nepali architecture. While enjoying a truly heavenly coffee, I was finally able to upload a few photos. 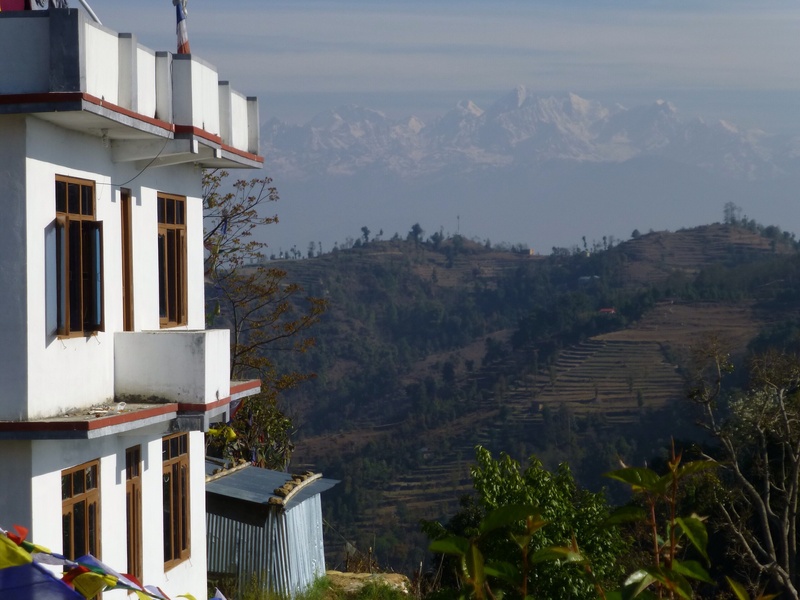 The rest of the photos will have to wait until I get to Pokhara in a few weeks. 5:30 am: I wake. A monk strolls the grounds ringing a bell to call the monks to prayer. Aside from the adult monks who teach and help manage the monastery, most of the monks here are boys, which means they don’t respond readily. There’s a lot of yelling, knocking, and prodding that accompanies the bell as bleary-eyed boys reluctantly rise from their peaceful slumber. Note: earplugs do not drown out the sound of young monks going to prayer. 7:00 am: The breakfast bell tolls. Everyone shuffles into the dining hall, which is full of neat rows of low wooden benches and tables. The meals are a fixed and simple vegetarian menu made up of traditional Tibetan and Nepali fare. Breakfast is usually a bean dish similar to dal, and tingmo—a Tibetan steamed, pillowy bread that’s like an unsweetened center of a cinnamon roll. If you could roll heaven in flour and steam it, you would have tingmo. Like everything at the monastery, mealtime is an orderly affair: chanting begins while monks go to each seated person doling out plates and utensils, while other monks follow to dish out the morning meal from massive stainless steel pots. When the chanting stops, the meal begins. A monk pours me some yak butter tea from a teapot the size of a watermelon. Yak butter tea is a milky, buttery brew that bears very little resemblance to actual tea and has little floaties in it from the dairy solids. Only three months ago I ate blood tofu in Taiwan, but I find that the combination of yak butter, milk, and floaties really pushes my limits (or perhaps I’m just less tolerant when I haven’t had coffee). There’s a sign in the hall that says “When you think you cannot finish your food, imagine those who have nothing to eat.” I feel guilty about not finishing my tea. 8:20 am: School is in session. I make my way down to the school building. The monastery is a complex of buildings built upon a hillside; as a result, some buildings are lower in elevation than others and all buildings have an unimaginable number of stairs. In fact, according to my rough calculations, over the course of a day I climb and descend more than two thousand stairs (my sore quads and glutes can attest to this fact, if you care to ask them). All that said, I make my way down to the school building by descending the hill and then descending thirteen flights of stairs. As I do, monks hurriedly pass on their way to class with a “Good morning miss!” as they go. One passes me, then comes back and asks “Can I carry your books, miss?” I think to myself how refreshing these boys (and young men) are as I descend yet another flight of stairs. 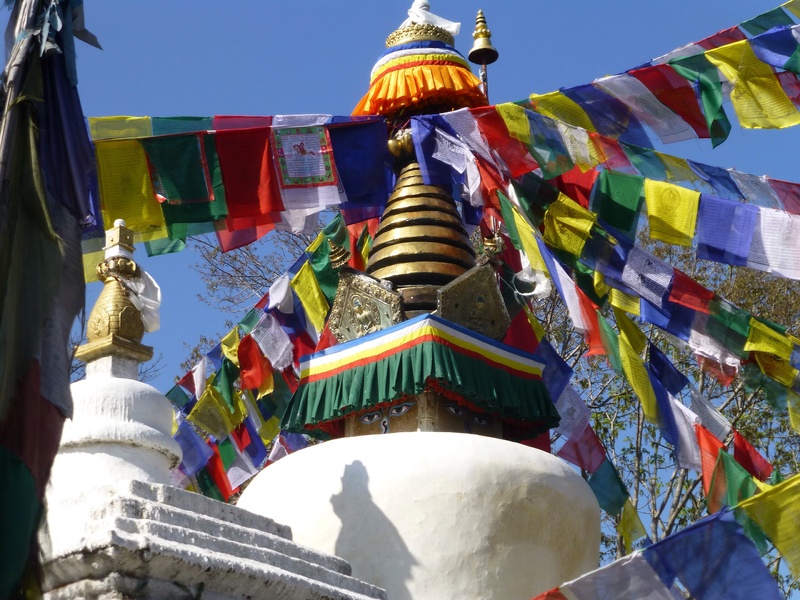 Classes occur every day unless there is a special puja (prayer/worship) or Tibetan holiday (this is a Tibetan Buddhist monastery, so they follow the Tibetan calendar and even speak Tibetan). I teach my morning English and computer classes. Today we’re discussing singular and plural nouns and their articles. I’ve noticed that articles are a tricky thing for them (they often skip straight to the noun), so I make sure we spend extra time on it and give them lots of examples and activities on the whiteboard. I’ve received feedback that the monks enjoy my classes and like the way I teach. I must be doing a decent job because today one of the school’s teachers joins my class to learn. 12:00 pm: Lunch break. I make my way back up those thirteen flights of stairs (and then up the hill) to go to the dining hall, which is in the main part of the monastery and accessible via…you guessed it: more stairs. Lunch is the biggest meal of the day and the young monks scoop out generous portions of each dish. It took me several days to figure out how to politely get smaller and smaller portions so that I wouldn’t waste any food. Today the meal is rice, a spicy potato dish, a vegetable that I think might be eggplant, and a milky sauce on top (which is undoubtedly from Mr. Yak, a truly useful animal around these parts). With the notable exception of yak butter tea, I’ve yet to encounter anything here that isn’t delicious. After lunch the monks have time to play before their afternoon classes. Groups of them stand in circles to play “chingi,” a hackeysack-like game that uses a wad of rubber string. 1:20 to 3:00 pm: The afternoon school session begins. I teach my last two classes, one of which is basic computers. As I mentioned previously, there are no computers in the room, so I’ve spent a great deal of time teaching terminology and how the different parts of a computer work together. Today the lesson is on storage devices. As you might imagine, every computer class is partly an English lesson, because I must explain “storage” and “device” before I can explain how that pertains to computers. Practical analogies are particularly handy. I am hoping my classes will get some time in the monastery’s computer lab soon. After class, I return to my dorm room to work on the next day’s lesson plan. Although there’s an “official” volunteer room (and even guest rooms) for visitors—with western-style toilets and bathrooms within the room itself—I’ve been assigned a small, private room in one of the monks’ dorms. This means that I have the same accommodations as the monks: a detached bathroom with a squat toilet and no toilet paper (as in other countries, they don’t use it here. Instead, there is a small faucet next to the toilet with a little bucket that you use to wash yourself). I don’t mind the simple accommodation, but using the squat toilet 100% of the time takes some… um… finesse.